There are a lot of modern-day artists I admire, but Turner for me portrays everything I aspire to. I find inspiration everywhere but usually in the ever changing huge skies and landscape. 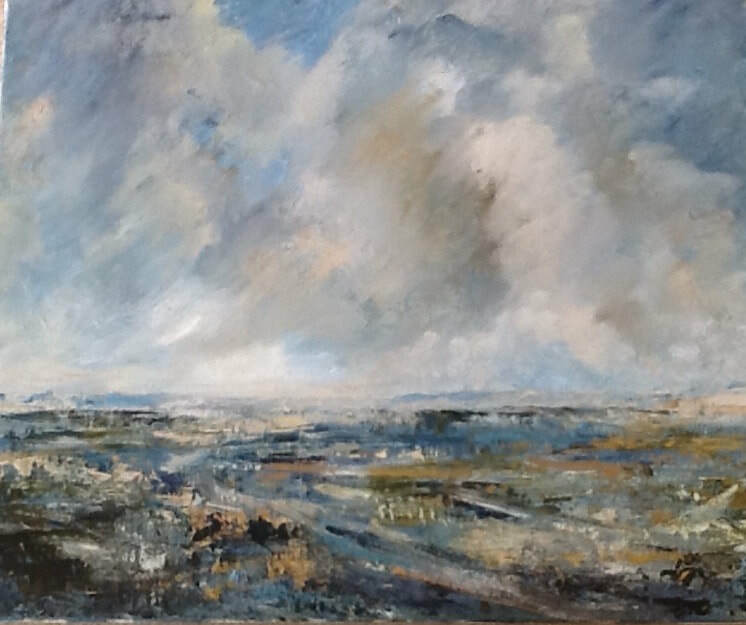 Currently I’m working on capturing the changing light in the sky and landscape, showing the fleeting colours and atmosphere with sweeping marks. Apart from the input from Jemma which has greatly helped my confidence, I find the diversity and support of the other artists on the course very helpful. I’m in the process of building a website, which in this day and age is very important if I want to progress with selling work. I feel I’ll never stop learning and want to push myself even further – so it looks like more courses are on the horizon! I’ve learned very quickly how important a sketch book is, as well as working outside to record the surroundings.As soon as I open the sketch book, I’m transported back to that moment in time. I work in oil on prepared board, card or canvas. Once the painting starts to progress I lay the sketch to one side and paint intuitively, using the brushstrokes, colour and marks to convey the light sound and atmosphere.